The only thing we knew about Rapid City was that it flooded recently, killing over 200 people. It turns out that wasn’t so recent, actually 1972! However, it was raining for so much of our short time here that we did see creek waters rising above the banks. 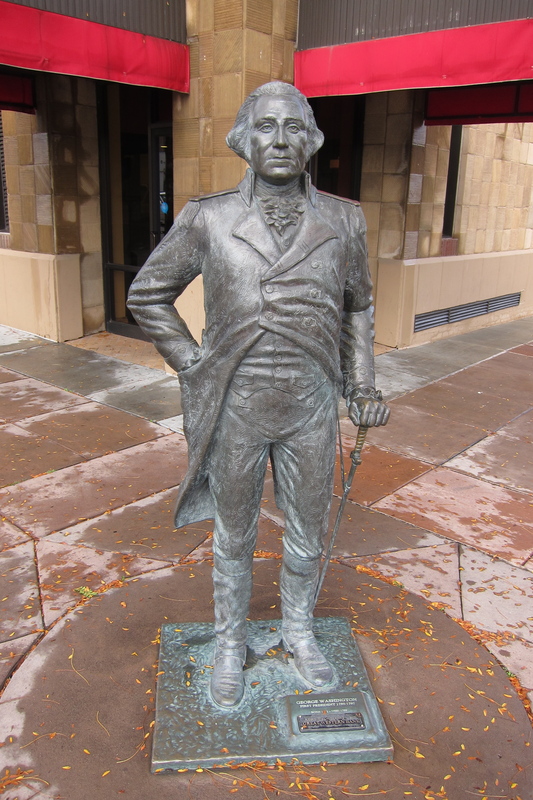 The town is simply delightful, with an amazing historic display: all 42 past presidents cast in bronze life-sized figures on the corners of the two main streets in the town. It’s like The Complete Works of Shakespeare (Abridged), only presidents. Taft was our heaviest president, over 300 pounds, but a good athlete. He’s getting ready to throw a baseball. We’ve followed an easy, shortcut path to accomplish something similar to Mark Real’s presidential birthplace visits, but ours took less than an hour rather than many years. 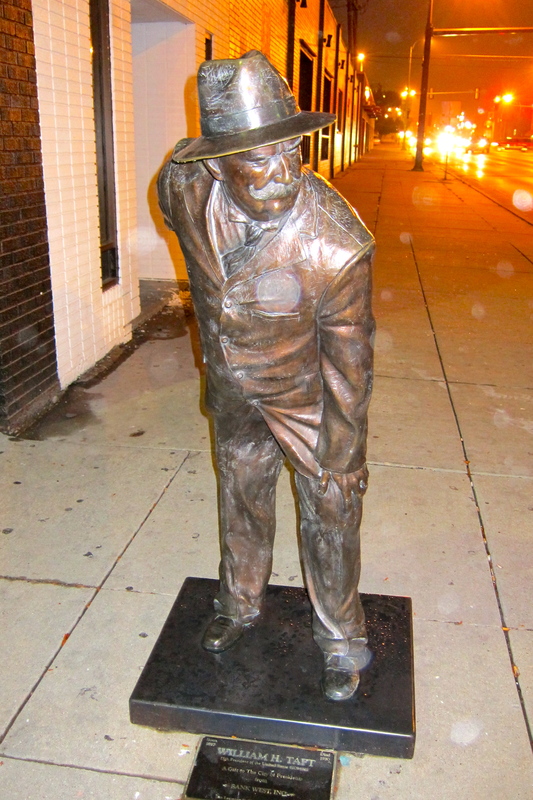 Truman, the president who almost wasn’t, according to early and incorrect headlines. In a brief moment without rain Monday night, we walked along Main Street and saw some favorites, then drove around Tuesday morning in the rain. Our breakfast cook at the AmericInn told us that South Dakota was the only state with bipolar weather: It’s either nice or it’s not. With very limited visibility, it looked like we wouldn’t visit Mount Rushmore on this trip! 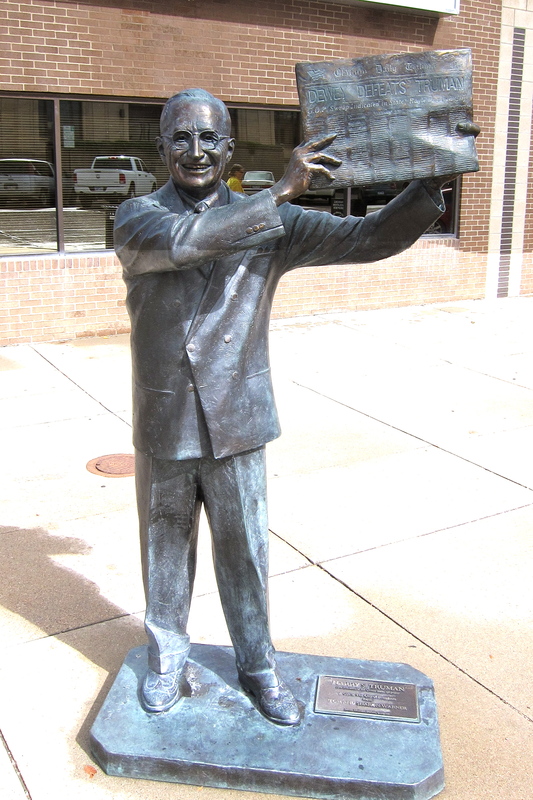 At least we saw the celebrated four, but in bronze rather than stone. 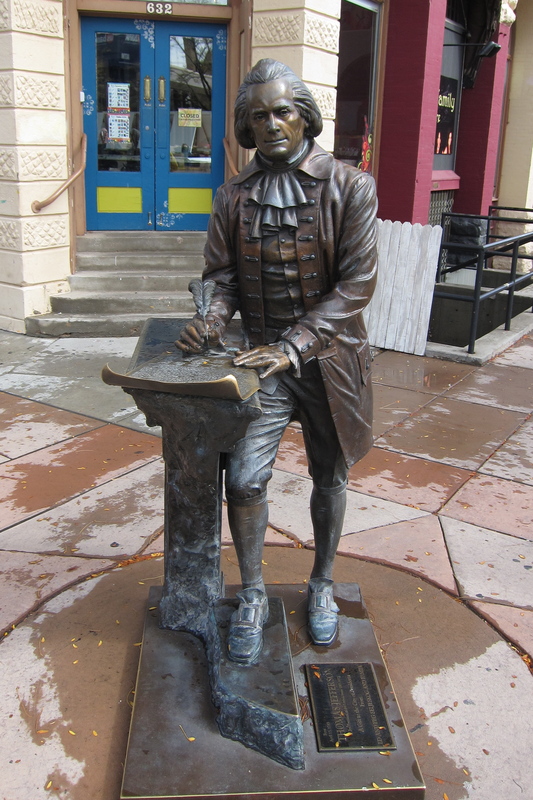 Jefferson, the best writer among our presidents. Better than John Hancock. And then the weather did an about-face. The cook was right! With blue skies for a half hour we were able to get close to the amazing monument. These 60-foot-tall granite carvings took 400 men, $1 Million, and 14 years to build. 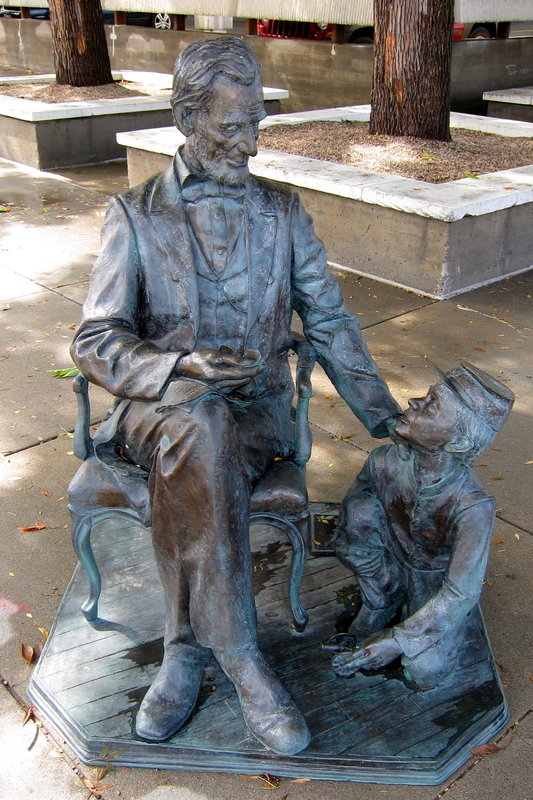 The sculpting was spearheaded by Gutzon Borglum and after his death completed by his son, Lincoln, presumably named after the president. 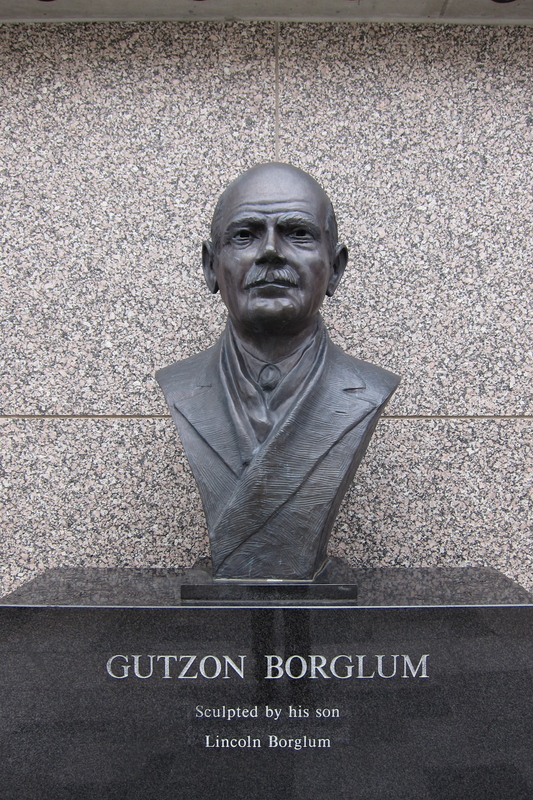 Borglum’s head at the monument is not 60 feet tall. 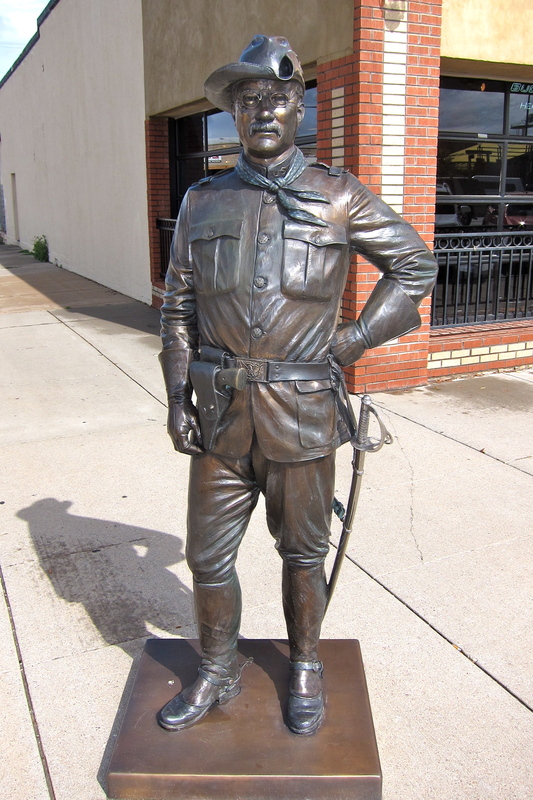 Borglum was on the team that created the large bas-relief of the leaders of the Confederacy on Stone Mountain, Georgia. He left after having “artistic differences.” Maybe a Lincoln fan just couldn’t embrace the idea of memorializing the Confederate leaders. 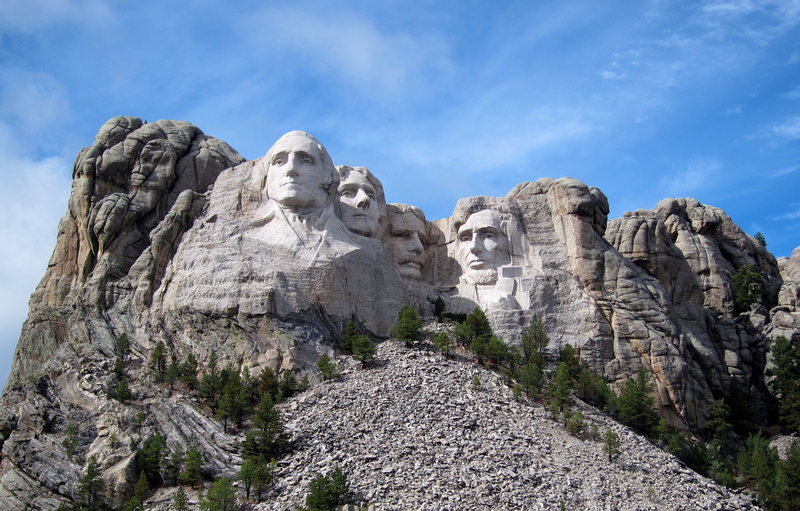 Borglum chose the four Mount Rushmore presidents (from the 25 who had served in the 130 years since the nation was founded) because their leadership represented great importance to the nation. Whether in battle, in separatism, or in preservation, these men showed bravery in taking a difficult path. 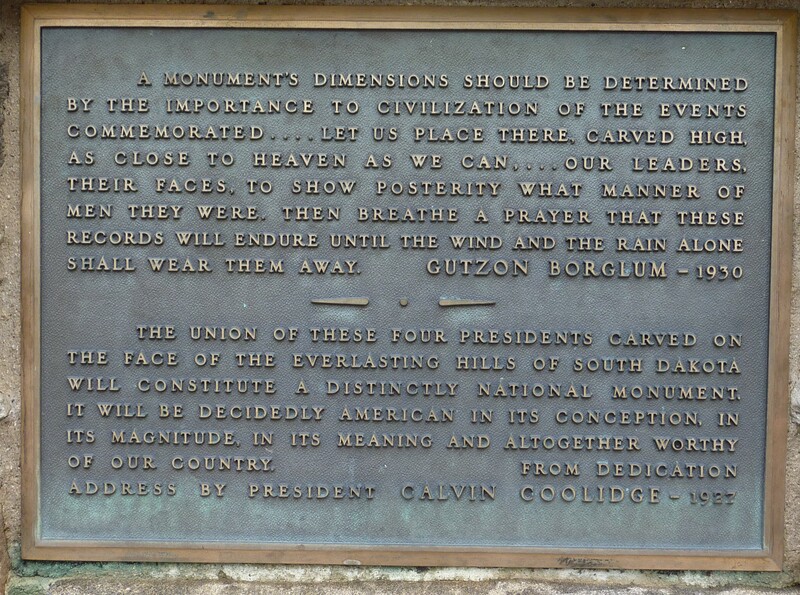 Dedications from Borglum and President Coolidge. An interesting tidbit: Did you know there was a campaign to add Susan B. Anthony to this foursome? She was, of course, a major voice in the women’s suffrage movement in the 1800s. Surprisingly the tribute was not proposed in the ragingly feminist times of the 1970s, but actually in 1937. The proposal was quickly kiboshed by the male powers that ruled, but it was at least an early start in recognizing that women mattered. South Dakota recognizes that Native Americans matter too. 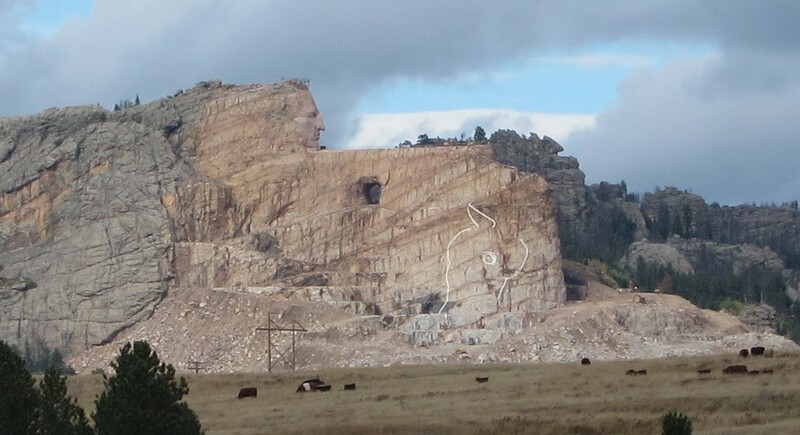 The Crazy Horse Memorial is underway just a few miles from Mount Rushmore. It is intended as a tribute to the brave spirit of Lakota leader Crazy Horse and other Native Americans and will ultimately be the world’s largest statue. It was started in 1948. The head was unveiled in 1998 and the rest is scheduled for completion…soon. We went to another mountain in addition to Rushmore: Mount Everest. Two Nepalese restaurants are at the top of TripAdvisor’s lists of best restaurants in Rapid City, even beating Longhorn Steakhouse! So why are two Nepalese restaurants here, halfway around the world from Nepal? According to Diva, our waitress at Kathmandu Bistro at dinner Monday, the town has 11 Nepalese doctors, and of course, they have to eat somewhere. The food was excellent! Then on our rainy Tuesday, we went to Everest Cuisine for lunch and met our waitress, the spitting image of Diva at Kathmandu. Yes, they were sisters. The same family runs both restaurants and they are only a couple miles apart. Trip Advisor says “best restaurant in Rapid City” but you might not notice it from the outside. Inside the food is fantastic. 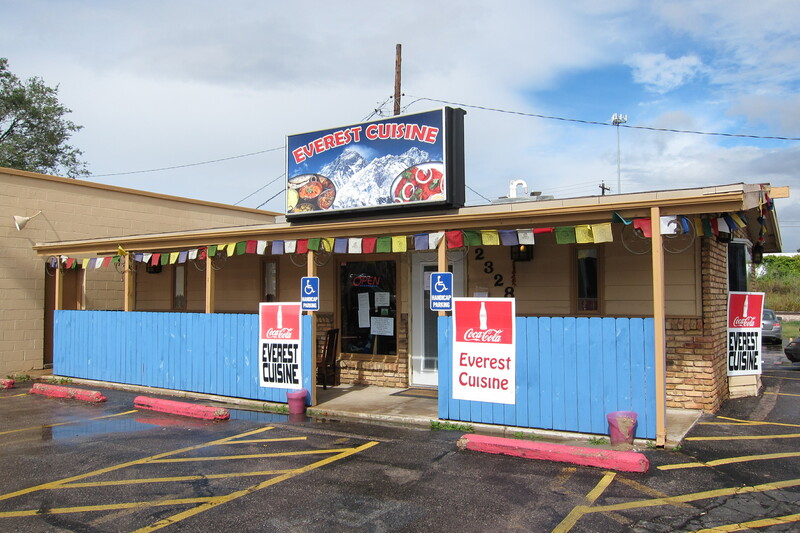 At Everest Cuisine the man who met us at the door was quiet and polite. But we learned he had a fascinating second job. Every spring he is a Sherpa on mountainous ascents in the Himalayas. 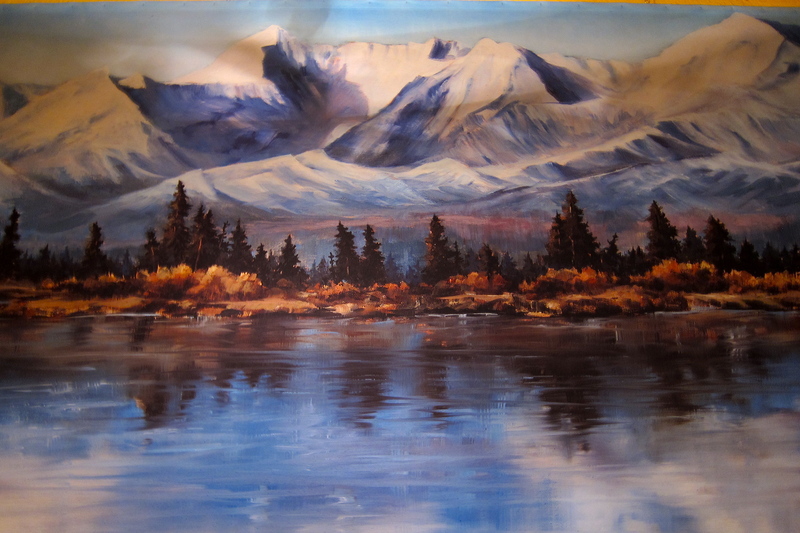 Kathmandu has this as a huge mural of the Himalayas, Everest Cuisine has a small framed print. Our waiter could have put “been there” pins at the tops of several of these peaks. He has made ELEVEN Everest ascents, the first at age 15, and four of them without oxygen. The teams he’s supported have included the son of Sir Edmund Hillary and big bosses at Mountain Gear and the North Face; they put their clothing through the paces. Last spring he was scheduled to make an Everest assault, but he chose to remove himself because of hazardous conditions. That climb encountered a fatal avalanche; sixteen climbers, who were friends and fellow Sherpas, were killed. Climbing in the Himalayas has changed since he first started. He shared some of the pluses and minuses. On the positive side, he can use Skype to maintain contact with his clients and his team in Asia. On the negative side, some of the culture and charm of the villages has been lost, overrun by the invasion of climbers. And he noted a very negative issue: global warming. Probably a strong contributor to deadly avalanches, the melting ice causes other changes that make the already difficult job for the Sherpas that much more difficult and dangerous. Nevertheless he will be leaving for the Himalayas in March, this time for an ascent of K2 from Pakistan. We wish him a successful climb, with a glorious summit and safe return. This entry was posted in Smell the Roses, Travel Journal and tagged Crazy Horse, Himalayas, Mount Rushmore, Nepal, presidents, Rapid City, South Dakota. Bookmark the permalink.